Izzy Eats: The art of raising a gourmand, one bite at a time: To Duck the Duck Egg-or not. Hi, this is Izzy's Mama's best friend who is going to occasionally guest blog for Izzy's Mama while she is recovering from surgery. I can tell you that she really appreciates all of the good thoughts and wishes coming her way. I am told she will need to be on a low fat diet for a month (less than 20 grams of fat a day). So feel free to post some yummy low fat recipes or treat ideas. The Sunday before Izzy's mama's surgery, I went to her house to help out with some chores because she was not feeling well. When it was lunch time, I offered to make Izzy's lunch. Izzy's Mama actually agreed to this offer so she really must not have been feeling well. We trudged down to the kitchen and Izzy's Mama took out a carton of duck eggs and a stick of butter. She sat down at the kitchen table and said "Have you ever used a cast iron pan? It is very good for you because you get iron in your food." While I have a cast iron pan at home and have used it a few times, I probably never used it correctly and besides I thought to myself I did not want to know my pan was leaching metals into my food. So I just sorted of grunted a response. Izzy's Mama, safely assuming that to be a "No", explained "You must heat the cast iron pan for 3 minutes or else the butter will turn brown." Perish the thought. I went to turn on the vintage stove and when I did not get a flame, Izzy's Mama said, "You need to blow on the burner." What! I need to turn on the gas and then put my face to the burner and blow? Is she crazy? Does she have good insurance? But throwing caution and all my common sense to the wind for I was now in Izzy's Mama's world, I forged ahead anyway, putting my face (with much trepidation) in the vicinity of the burner and blowing and blowing. Nothing. I immediately thought about throwing in the towel at this point and was starting to look around for some peanut butter when Izzy's Mama innocently volunteered "You can also use the igniter thing on top of the fridge". You have to be kidding me. I then successfully lit the burner, put a pat of butter in the cast iron pan and waited to 3 minutes. Then I took a look at those duck eggs. They were about twice the size of a chicken egg. Izzy's Mama said Izzy likes his eggs "over easy". Okay, I thought. I can do this. I grabbed an egg from the carton and as I was about to smash that egg on the rim of the pan, Izzy's Mama blurted out, "Izzy will not eat that egg if you break the yolk." Thanks for the tip, Izzy's Mama. I gingerly tapped the egg on the rim of the pan. Nothing. I applied more force. Still nothing. I pounded the egg against the rim of the pan (who knew duck eggs shells are harder and thicker than chicken egg shells) until I made a dent in the shell. I kept banging away until I created a little crack and then I wedged my finger in the crack and ripped the egg apart. By some miracle, the yolk did not break. I grabbed a spatula from a container of utensils on the stove and just as I was going to flip the egg, Izzy's Mama cried out "Oh no, that spatula is too thick you need the one in the drain board." I had previously been warned not to over cook the egg because Izzy likes to break the yolk with his bread. I dashed to the drain board, grabbed the spatula and ran back and flipped the egg. Although I have cooked eggs before, I confess that I have never cooked a duck egg and I have never cooked an egg under the watchful and expert eye of Izzy's Mama. I was scared. So I grabbed a pot holder and lugged the cast iron pan over to where Izzy's Mama sat to show her my creation and to ask for her blessing. She decreed "a little longer" and waved me off. With a sigh of relief, I finally put that egg on a plate, took a piece of bread and buttered it with butter from the stick of butter still out on the table. My relief was short lived because Izzy's Mama looked at me woefully and said "That butter is for cooking. We have different butter for eating." At that point I just ignored Izzy's Mama and called Izzy to the table. I am happy to report that the yolk was appropriately runny and Izzy ate the whole thing including the incorrectly buttered bread. Izzy's Mama and I each had a fried duck egg. She likes hers prepared the same way that Izzy does. I like mine well done. I found the duck egg to be oddly sweet but tasty. 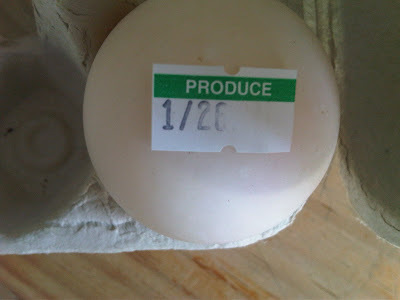 Izzy's Mama says they are $1.00 an egg at Whole Foods. Thanks a bunch to Izzy's Mama for introducing me to duck eggs. That was well written,but you obviously are not the mam of an only child! Picky eaters are one thing,but only children are another.I look forward to you future blogs. Maybe we can collaborate on our memories of Izzy's mamas childhood and Social Teas. Istill eat them with nostalgia! Lynn, how are you? Thinking about you and wondering... You are in my thoughts.